Directions (1 - 5): In each of the following questions, a question is followed by three statements I, II and III. Read all the statements to find the answer to given question and then answer accordingly that which statement/s can give the answer alone/together. Find the difference between compound interest on that sum at 5% per annum after 2 years and simple interest on that sum at 6% per annum after 3 years. Difference between compound interest and simple interest on that sum at 4% per annum after two years is Rs.86.4. Simple interest on that sum at 8% per annum after six years is Rs.25920. The sum amounts to Rs.60674.4 on compound interest at 6% per annum after 2 years. Even I, II and III together are not sufficient. Hence, any one of the three statements is sufficient. Diya, Maya and Sunita entered into a partnership for two years with investment in the ratio 5: 9: a respectively. At the end of two years, they earned a total profit of Rs.141000. Find the share Sunita in the profit. If Sunita had invested her amount on simple interest at 7% per annum for five years, she would have earned an interest of Rs.24500. After one year, Diya doubled her investment. Had Diya invested her amount on simple interest at 5% per annum for four years, she would have earned an interest of Rs.10000. Hence, All I, II and III together are sufficient. Anita with double her efficiency and Kiran can complete a piece of work 12 days. Find the time taken by Anita and Simran to complete the work. Kiran, Madhav and Simran together can complete the work in 8 days. Madhav and Kiran together can complete the work in 15 days. Madhav and Simran together can complete the work in 10 days. Ratio of the ages of Vikash and Rana before four years was 14:13 respectively. Find the present average age of Vikash, Atul and Vinay. Ratio of the present ages of Vikash and Atul is 4:3 respectively. After four years, ratio of their ages will be 9:7 respectively. Average of the present ages of Rana and Vinay is 33 years. Ratio of the present ages of Atul and Vinay is 2:3 respectively. Required average = (32 + 24 + 36)/3 = 92/3 years. Hence, Either I and II or I and III are sufficient. Find the time taken by train A to cover a distance of 462 Km. Train A can cross a platform of length 520 m in 72 seconds. Train A can cross another train of length 460 m coming from opposite direction with the speed of 36 Km/h in 36 seconds. Length of train A is less than the length of train B by 140 m.
Hence, Either I and II or II and III are sufficient. The following line graph represents monthly income (in Rs.) of five persons. 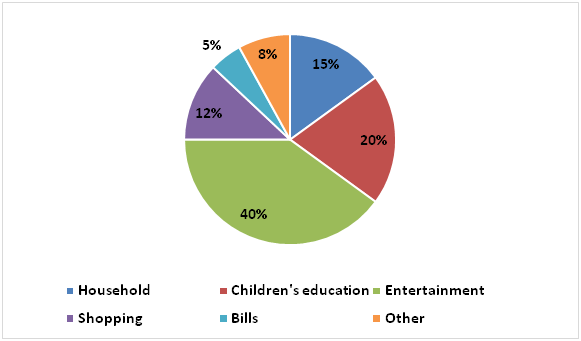 The following pie chart represents percentage wise distribution of total expenditure of Pavan. 6. If Kiran expands 20% of her income on Entertainment, find the respective ratio of the expenditure of Kiran on entertainment and expenditure of Pavan on entertainment. 7. Respective ratio of the expenditures of Tapan and Madan is 5:6 and respective ratio of their savings is 1:3. Find the difference between the expenditures of Madan and Tapan. Let, expenditures of Tapan and Madan be Rs.5k and Rs.6k respectively. 8. Total expenditure of Neelam is 45% of her income and she uses 20% of her total expenditure on household for System service. Expenditure on system service of Neelam is approximately what percent of the household expenditure of Pavan? Required percentage = (5850/5400) x 100 = 108.33% = 108% approx. 9. Respective ratio of the savings of Kiran and Neelam is 4:3 and respective ratio of their expenditures is 6:5. Find the average of the savings of Kiran and Neelam. Let, savings of Kiran and Neelam be Rs.4k and Rs.3k respectively. 10. Respective ratio of the expenditures of Pavan and Madan on bills is 9:11 and respective ratio of the expenditures of Pavan and Madan on shopping is 5:6. Expenditure of Madan on shopping and bills is approximately what percent of his total income? Directions (1 – 5): In each of the following questions, a question is followed by three statements I, II and III. Read all the statements to find the answer to given question and then answer accordingly that which statement/s can give the answer alone/together. 1) Find the difference between compound interest on that sum at 5% per annum after 2 years and simple interest on that sum at 6% per annum after 3 years. e) Even I, II and III together are not sufficient. 2) Diya, Maya and Sunita entered into a partnership for two years with investment in the ratio 5: 9: a respectively. At the end of two years, they earned a total profit of Rs.141000. Find the share Sunita in the profit. 3) Anita with double her efficiency and Kiran can complete a piece of work 12 days. Find the time taken by Anita and Simran to complete the work. 4) Ratio of the ages of Vikash and Rana before four years was 14:13 respectively. Find the present average age of Vikash, Atul and Vinay. 5) Find the time taken by train A to cover a distance of 462 Km. 6) If Kiran expands 20% of her income on Entertainment, find the respective ratio of the expenditure of Kiran on entertainment and expenditure of Pavan on entertainment. 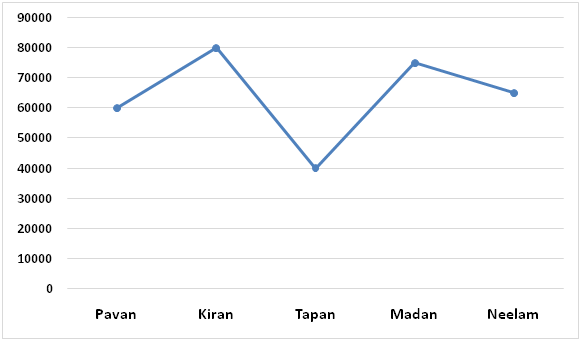 7) Respective ratio of the expenditures of Tapan and Madan is 5:6 and respective ratio of their savings is 1:3. Find the difference between the expenditures of Madan and Tapan. 8) Total expenditure of Neelam is 45% of her income and she uses 20% of her total expenditure on household for System service. Expenditure on system service of Neelam is approximately what percent of the household expenditure of Pavan? 9) Respective ratio of the savings of Kiran and Neelam is 4:3 and respective ratio of their expenditures is 6:5. Find the average of the savings of Kiran and Neelam. 10) Respective ratio of the expenditures of Pavan and Madan on bills is 9:11 and respective ratio of the expenditures of Pavan and Madan on shopping is 5:6. Expenditure of Madan on shopping and bills is approximately what percent of his total income?